AUSTIN--(BUSINESS WIRE)--Village Farm, a dynamic tiny home community based in East Austin, is addressing Austin’s affordability crisis. Developed by Roberts Communities with an initial phase of 40 home sites and an additional 112 sites in phase two, buyers can own for as low as $70,000. Big on character, small in space, the free-standing tiny homes come in multiple designs with 399 sq. ft. Each tiny home is rooted in sustainable design, built using environmentally friendly materials, striking the perfect balance between sustainable living and modern convenience. Environmental stewardship is a cornerstone of Village Farm. Amenities include a general store and café, community kitchen, amphitheater, pathways and sidewalks connecting homes, a farm, gardens, a school, neighborhood pocket parks and commercial areas weaving a network reminiscent of a tradition village. Green Gate Farm, Texas’s only certified organic farm, has also partnered with the community and residents to create a community resource for neighbors of all incomes. 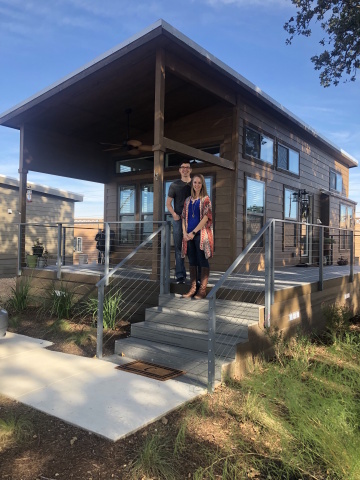 As one of the first tiny homeowners to move in, Sarah Cox, who is an employee of Baylor, Scott & White, believes “the plans to move the tiny homes to the farm across the street was a huge appeal” in their decision to move from their Georgetown home recently. Roberts Communities: Roberts Communities has been an owner and operator of family communities for over 40 years ago. The founder’s, R.C. Roberts, high standards and professionalism guide the second generation of the Roberts family in maintaining excellent long-term relationships with their residents. Owning, developing and managing these communities with unsurpassed hospitality has given the Roberts Family a reputation in the highest regards. This is what the Roberts Family is all about relationships, professionalism, family, hospitality and always a sense of home. Village Farm, a dynamic tiny house community based in East Austin, is addressing Austin’s affordability crisis.